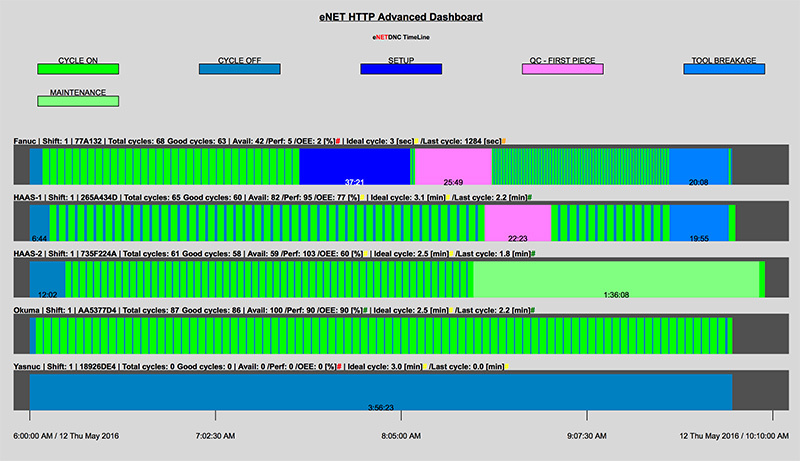 Web-based Monitoring Dashboards, available in a detailed or timeline view. Both Dashboards display Machine, Part, Cycle, Shift, Operator and even OEE or Machine Efficiency info. These Dashboards are easily accessible on any web browser, and will automatically refresh. Great for displaying on large-screen monitors in the shop. Customizable for number of machines displayed, colors, font size, refresh interval and title of Dashboards. 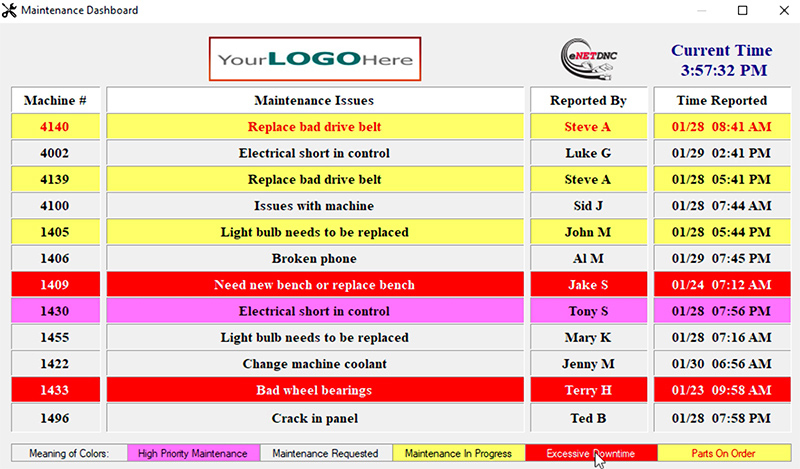 Customer logo can also be easily added to dashboards. Gain remote insight for the current status of machines on the shop floor. Initial software purchase provides 4 seats of dashboards, allows for up to 16 different users to be specified. This unit connects directly from the ethernet network to the USB port on the machine tool, and is the only DNC system that can connect directly to a CNC machine that comes from the manufacturer with just a USB port. Includes power adapter and USB cable. Dimensions 3.625"W, 1.375"H, 6.125"L ,and 'up to' 5mbps speed (dependent on network). This unit is for CNC's with serial ports and a wired ethernet connection to your network. 8 Serial Ports for CNC's, 1 Ethernet Port to connect to network. This unit will give you the ability to collect data at the CNC and to easily be able to upload/download programs and enter monitoring events. 1 Serial Port for CNC, 1 Serial Port for Scanner, and 1 Serial Port to connect to eHUB or xlConnect Unit. Comes with 7' CAT-5 cable and 12V power supply. This unit is wireless and used on CNC's that have an ethernet port for communications, supports FTP and CAPS. 1 Ethernet Port for CNC, 1 Serial Port for accessories. This unit is for CNC's with a serial port and a wired connection to your network. 1 Serial Port for CNC, 1 Serial Port for accessories, and 1 Ethernet Port to connect to network. This unit is wireless and used on a CNC with a serial port (RS-232). 1 Serial Port for CNC, 1 Serial Port for accessories. Wireless is 802.11 B or G.
This unit is wireless and is used on CNC's with USB ports, it mimics a USB thumb drive. 1 USB Port for CNC, 1 Serial Port for accessories. Comes with 4' USB cable and 12V power supply. This unit is for collecting signals from machines such as Cycle On, Feed Hold, Spindle on/off, Feed Rate Override, Spindle Override, etc. 1 Serial Port for connection to eHUB or xlConnect, 1 Serial Port for CNC (optional). DB25 Connector, connects to – 8 Digital outputs, 2 Analog outputs, 1 Digital input. Multiple boards can be connected to a machine. This unit is for scanning data in at the CNC for eNETDNC to use for DNC, Data Collection or Monitoring. 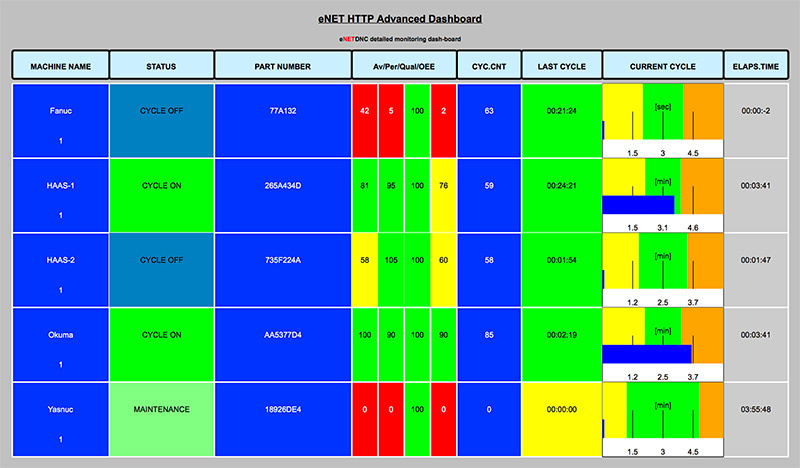 eNETDNC LT is a fully functional DNC system including a full-featured copy of the eNET CNC Editor. The eNETDNC LT version lets each computer communicate (DNC) with up to 10 CNC’s each simultaneously. You can restart drip-feeding a program from any location within the program. With the interactive Back-Plotting you can run the part step by step forward and backwards, and can click on any intersection and be taken right to that line of G-Code within the program. eNETDNC LT also has many other editing features making it easier to update your G-Code. 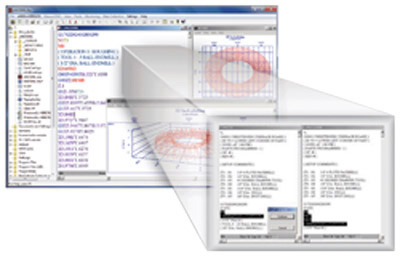 eNETDNC LT Software also works as a companion to eNETDNC, allowing for edits of CNC programs, Back Plotting of G-Codes, Math utilities and queuing of CNC files for downloading with eNETDNC from a workstation. If Monitoring is added to eNETDNC then you can also do standard monitoring reports and utilize the Monitoring Dashboard, right from a computer on the shop floor or in the office. eNETDNC LT is sold by seat and customers can add as many seats as they like. eNET is proud to announce the release of a new addition to the eNET family of softwares, eNETMD. 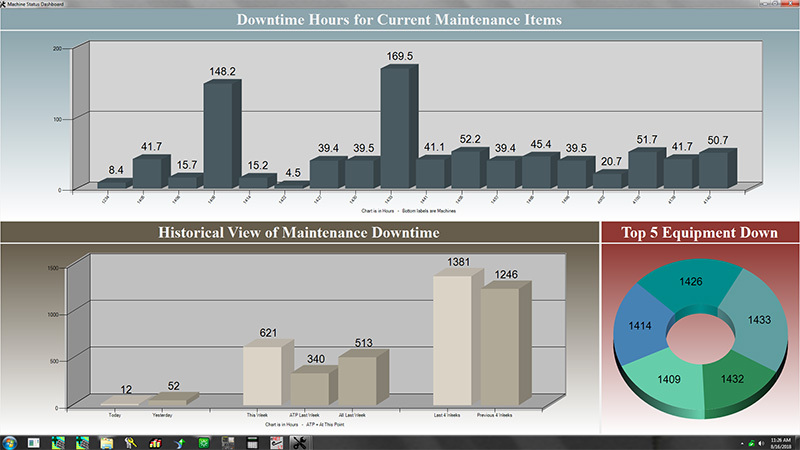 This powerful yet easy-to-use Maintenance Dashboard will simplify your shop's Maintenance Scheduling & Reporting. 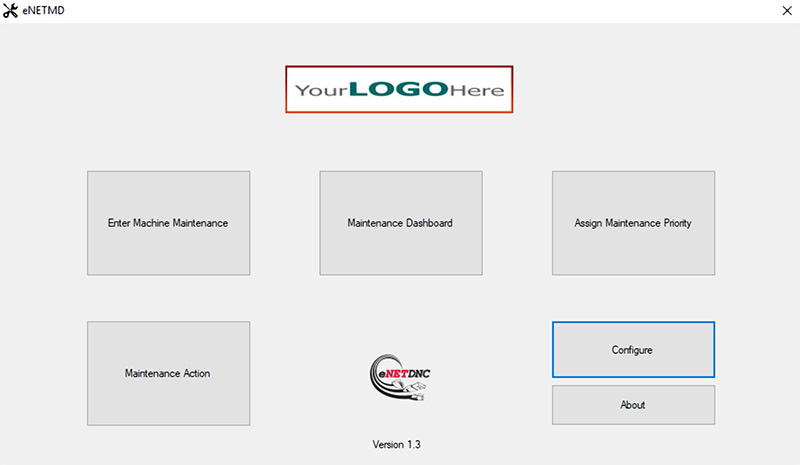 This customizable software is hosted on-site, with a streamlined design that will not stress your local network. A real-time Maintenance Dashboard allows for full visibility of your facility & machine maintenance needs throughout the whole organization. Designed hand-in-hand with eNET Customers to provide the most important CMMS tools, without the clutter of unnecessary extras found in legacy CMMS systems. Schedule or prioritize today's Maintenance needs or even weekly, monthly and yearly Preventative Maintenance projects. eNETMD also offers an email server with automated notifications to improve communication within your Maintenance Department. Get control of your Maintenance planning today and use eNETMD to minimize maintenance-related machine downtime on the shop floor. Made in the USA!